"You're not the bad guys, we are." Is anyone excited to see this? STX Entertainment has revealed a second, final trailer for the action crime thriller titled Den of Thieves, also known as Criminal Squad in Europe, from writer/director Christian Gudegast. The movie is about a thief who gets trapped between two sides of a heist and two sets of "criminals" - an elite unit of the LA County Sheriff's Deptartment and the state's most successful bank robbery crew. Gerard Butler stars as the guy stuck in the middle, with 50 Cent, Pablo Schreiber, O'Shea Jackson Jr., Sonya Balmores, Maurice Compte, Evan Jones, Brian Van Holt, Jordan Bridges, and Eric Braeden. This looks as bad as it did in the first trailer, and I'm already ready to forget about it and move on. Another bland January action movie release that will be forgotten quickly. 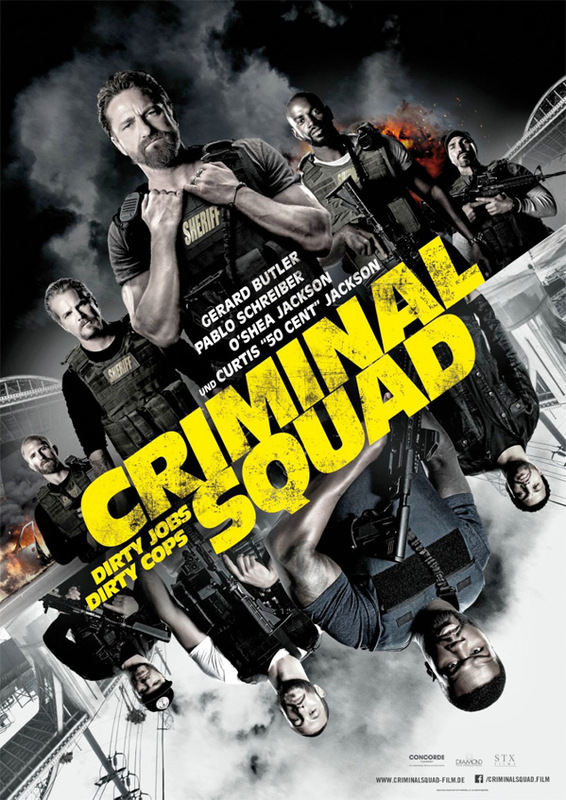 The title of the film in Europe is Criminal Squad, hence the different title on the poster. See the US poster. A Los Angeles crime saga in the vein of Heat, Den of Thieves follows the intersecting and often personally connected lives of an elite unit of the LA County Sheriff's Department and the state's most successful bank robbery crew as the outlaws plan a seemingly impossible heist on the Federal Reserve Bank of downtown Los Angeles. Den of Thieves is directed by Los Angeles native Christian Gudegast, making his feature directorial debut after writing the screenplays for London Has Fallen and A Man Apart. The screenplay is written by Christian Gudegast and Paul Scheuring. STX Entertainment will be releasing Gudegast's Den of Thieves in theaters everywhere starting January 19th, 2018 at the start of next year. Who's down for this?